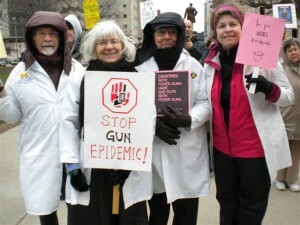 Dr. Cheryl Farmer, Dr. Cindy Krueger, Dr. Angelos Constantinides, and Dr. Andrew Zweifler demonstrated in Lansing, Michigan, with Moms Demand Action on Gun Sense . More than 100 people were there. Dr. Zweifler distributed information about Physicians for Preventing Gun Violence. Dr. Farmer did a lot of work on this, and had this photograph taken with her camera. Right to left: Dr. Zweifler, Dr. Farmer, Dr. Constantinidis, and Dr. Kreuger.